USB 2.0 support connect USB Keyboard, USB Flash Drive, USB Mouse etc. Support USB data hot swap sync to PC or Smartphone or Tablet. 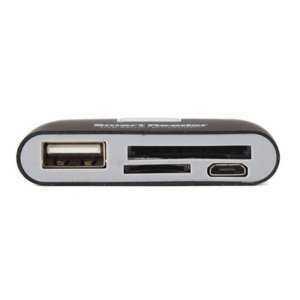 With micro USB port for charging your phone or tablet via Micro USB port. Two card slot can read or write your TF/Security Digital Card anywhere. Features OTG function, compatible with devices OTG (USB On-The-Go) enabled. Exquisite workmanship provides stable and higher performance. Simple to use and wide compatibility. Mini and lightweight design for convenient and portable carry.